Hi everyone! I’m currently kind of feeling a bit down about blogging – I’m sure it’ll pass (it always does), but I’m kind of just feeling like I stink. LOL! Don’t get me wrong, I work hard at swatching and editing and writing up these posts but sometimes it just gets to feel like I’m talking to myself. So before you leave, say hi, would you? Because I really treasure those comments that you leave – even if I don’t always get a chance to respond right away. 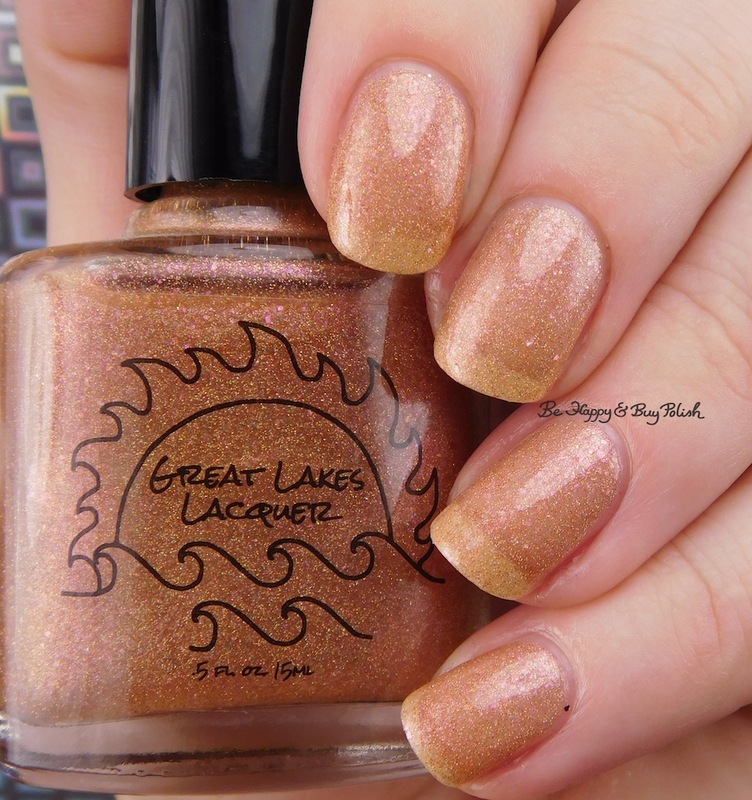 Anyway – I have two polishes from Great Lakes Lacquer to show you this morning: Fools Gold and The Quick-Witted Comedian. Fools Gold is a gold based holographic nail polish with bits of pink/peach. Formula has an okay consistency and it applies sheer; it dries matte. This is 3 coats plus top coat. The Quick-Witted Comedian is a teal polish with silver shimmer and blue iridescent flakes. This had a good consistency and it applied a bit sheer; it was kind of stinky (I’m guessing due to pigments). This is 2 coats plus top coat. I really like Fools Gold, I think it would really look great as a topper for a bit of extra sparkle! As a fellow blogger, I feel this way all the time. I’m going to make it it a point to start commenting. So ‘hello’ and thanks for the great swatches. Thank you! I’m trying to make more of an effort to. Really nice colors they are. As requested…hi! I discovered your blog a couple months ago & should’ve thanked you then for introducing me to so many great indie polishes. So thank you very much & I definitely appreciate all your hard work! Beautiful swatches, as always. I never tend to comment but I really enjoy your blog and appreciate all the hard work you put in. Your swatches are always lovely and I love that you give your honest opinions. It makes it a lot easier to decide on a purchase when you know how easy or difficult a polish is to work with, not just how pretty it looks. Thank you so much Lisa. Your kind words really lifted my spirit. ❤ I’m so glad that you find my blog useful! Hi! Sorry I lurk on your blog instead of commenting! I’ve been reading your stuff for ages because not only are you awesome, I love that you still cover mainstreams, drugstore and vintage polishes! Seeing your recent sOPI posts made me feel like I’m not crazy. I mean, indies are great, but sometimes it feels like it’s not ok to break the indie orthodoxy or stay up on the constant collection releases…. Oh i just can’t keep up anymore with constant releases. And some of the old school polishes are my faves! I really need to go polish hunting over at Big Lots & Ross soon! Thank you so much for stopping by & commenting Sarah!